“We needed that win. After the loss against RMC, we need to bounce back and the boys were ready,” said Stingers rookie Chase Harwell. After a tough loss earlier this week against the Royal Military College in a 2-1 game, the Stingers bounced back in a fast, physical matchup with the Carleton Ravens. After a game one loss, it seemed as if the Stingers may have been staring down the eight ball to start the season. Adversity was a word brought up by players and coaches alike. There were already some injuries, the team had lost it’s top scorers (Anthony Beauregard and Massimo Carozza) to professional contracts, and were headed into the season down a game with a lineup full of rookies. Those rookies, with some veteran help, certainly came out trying to prove that the lack of experience wouldn’t slow them down. Rookies like Chase Harwell who scored the Stingers’ third goal, Hugo Roy, the first line centre, and Charlie Roy, a force on defence all night, made a big impact on their first night playing at the Ed Meagher arena. Older players like Neill certainly like what the young guns are bringing to the table to replace the players they lost in the offseason. “We might have lost players like Beauregard who have strong playmaking abilities but we’ve got guys like Chase [Harwell] and Hugo [Roy] coming in. They can change the pace of a game,” explained Neill. That speed and game changing pace were a major part of the win. Philippe Sanche joked after the game that the rookies were playing so fast he had trouble keeping up. On defence he was stingy and kept the puck out of his zone more often than not, on offence he found the back of the net less than a minute into the game thanks to a stretch pass by Philippe Hudon and a quick shot. “We actually tried [the play] twicein a row and I just didn’t see it. Hudon tried it again. It was a nice way to start the game,” said Sanche with a smile. As “nice” of a game and win it was for the team, it wasn’t without issue. Penalties cost the team their early lead and plagued them throughout the game, including an ejection for defender turned winger Philippe Charbonneau on a high hit. Penalties cost the team against RMC as well. Only one of the four goals against the team has been scored at even strength and it came directly after a penalty ended. Neill attributes the issue to summer rust and players still getting used to each other and a new game for many. His coach agrees that it’s a fixable problem. “We’re a young team. We’ll do some video and I’ll show them what’s a good penalty and what’s not. They’re gonna learn from it,” said head coach Marc-André Élement. This game will certainly stand as a teaching point for the kind of play his rookies can expect in U Sports. Carleton played a fast, heavy hitting game, but that didn’t intimidate Harwell much. “All the boys were telling me, Carleton likes to play like that, they love to get under your skin. But I like that. I love that kind of game,” he said. If the team wants to continue to win in the face of adversity, they’ll need the rookies to continue the scoring that Harwell started tonight. Most of the offence has come from the top line composed of Hudon, Hugo Roy, and Sanche so far. If this game is any example though, the rookies are starting to look ready for the league. 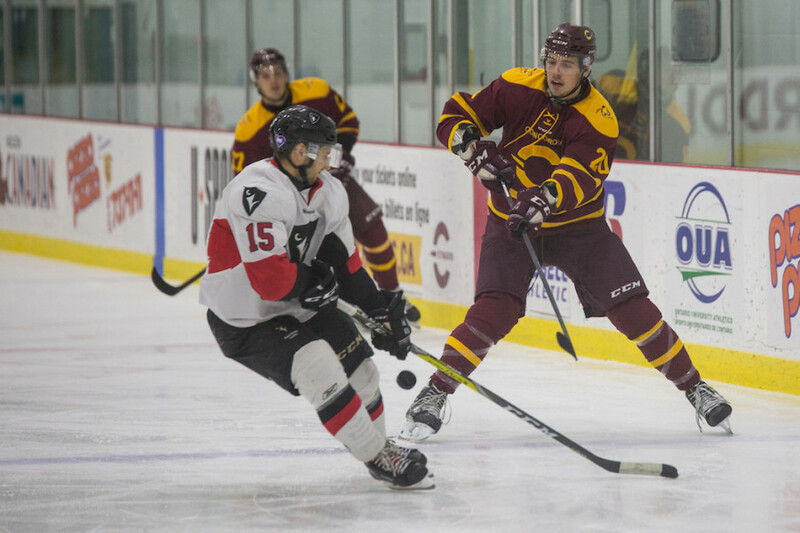 The Stingers’ next game is against Université de Québec à Trois Rivières, Oct. 13 at the Ed Meagher Arena.